A study led by the University of Leeds has found that about 80,000 deaths are prevented each year due to the introduction of European Union (EU) policies and new technologies to reduce air pollution. Relationships between the amount of air pollution and impacts on human health to attribute the number of lives saved due to the improved air quality. The study, published in the journal Environmental Research Letters, is the first to look into the effectiveness of specific EU policies to reduce air pollution across Europe. It reveals that the policies have led to a 35% reduction of fine particles in the atmosphere over the period 1970 to 2010, which has improved public health across Europe. The good news, however, comes at a time when such policies face an uncertain future in light of a potential Brexit. Study co-author Dr Dominick Spracklen, from the School of Earth & Environment at the University of Leeds, said: "Our work shows that EU policies have improved air quality. If the UK were to exit the EU, our air quality policy would no longer be subject to EU legislation, with potential implications for future air quality. "Regardless of the UK's position in the EU, it is vital that we continue to reduce air pollution emissions to ensure future air quality and the health of the British public." 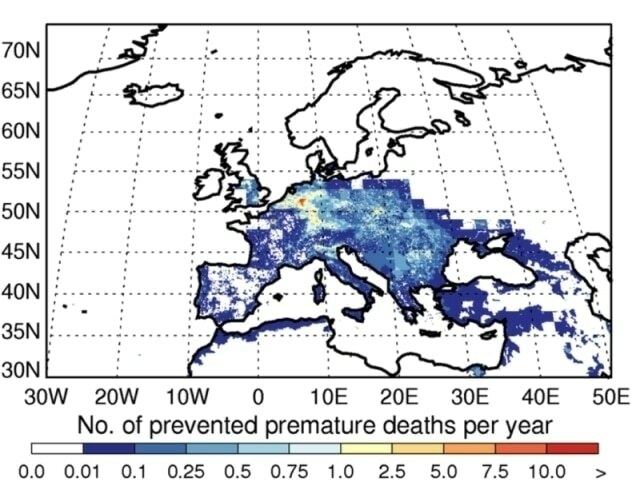 In the study, the researchers used a computer model to compare the current amount of air pollution simulated across Europe to a scenario in which no air quality legislation or new emissions technologies had been introduced since 1970. Such policies to reduce emissions include EU regulations for the improvement in fuel quality and the adoption of European emissions standards in transport. The study also looked at technological advances to reduce emissions, such as the introduction of particle filters and catalytic converters. The researchers then used relationships between the amount of air pollution and impacts on human health to attribute the number of lives saved due to the improved air quality. The study reveals that an average of 80,000 lives are being saved each year across Europe. Study co-author Professor Ken Carslaw, also from the University's School of Earth and Environment, said: "To put this number in perspective, in 2011 just slightly in excess of 400,000 premature deaths were attributed to particulate air pollution over Europe. So EU policy has dramatically improved the health of European citizens." Lead author Steven Turnock, a PhD student at the University's School of Earth and Environment concludes: "Air pollution is a trans-boundary problem that does not recognise national borders. The improvements in human health shown in this research have been achieved by European countries acting together. "Our research highlights the need to maintain and strengthen existing air quality policy in the face of a possible exit from the EU and develop new technologies that will further drive down emissions."